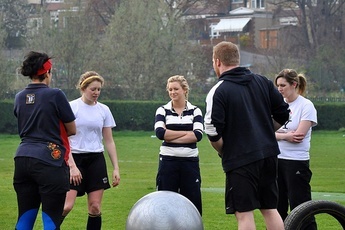 5 Apr 2011, 7:08 a.m.
On Saturday 26th March Hackney RFC hosted a Women's Rugby Development Day at Springhill. The event was open to all, and over 45 women made it along and enjoyed some top-class training sessions from a number of guest coaches, including England Women's legend Helen Clayton and future star Abi Chamberlain. The day finished with a number of 7s games, where the skills learnt were put on display and some great running rugby was played. The club would like to thank everyone that took part, and especially Will Fraser, Max Malkin, Helen Clayton and Abi Chamberlain; the coaching was brilliant and the day wouldn't have been anything like the terrific success it was without their help.